I’ll let you in on an open secret: Though we’ll claim it doesn’t matter, all photographers like it when we know our pictures have been seen and appreciated. We’re like kindergartners bringing home our finger paint art…we want mom to put in on the fridge. So I’m not gonna lie, I was thrilled to see the picture below and know that at least one of my photos had been in front of the eyeballs of the Holy Father Pope Francis. Notre Dame senior Juan Manuel Segura somehow managed to meet the Pope during a family visit to Rome earlier this month. 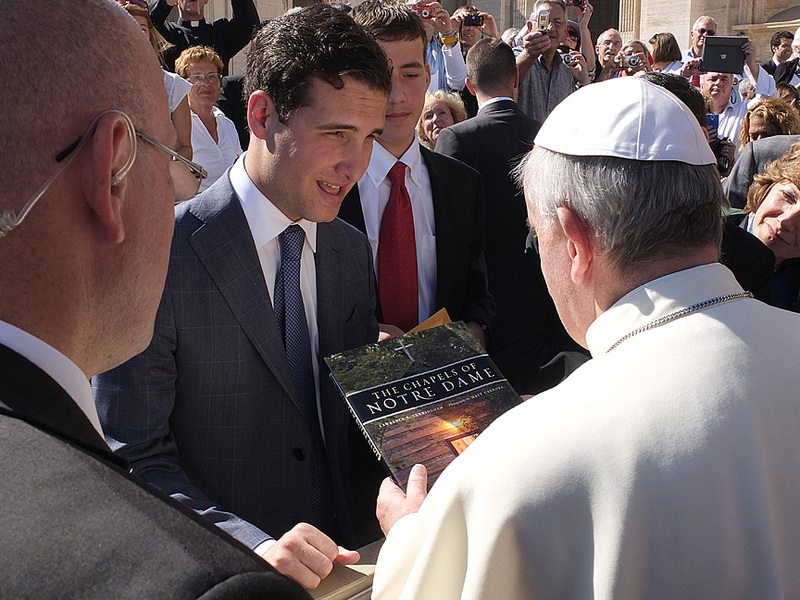 He presented Pope Franics with a copy of “The Chapels of Notre Dame.” A Vatican photographer got this photo and it made its way back to me. I hope the Pope enjoys reading about all 67 chapels featured in the book! So thank you to Juan Manuel Segura for choosing that book as a gift to give to the Pope…it made my day.